The cast of characters returns and this time, Andy has gone to summer camp leaving his toys to do as they please for a few weeks. Woody learns that his model and make has gone out of print and that he is pretty high priced in the collector field and is rare. Some nerd collector steals Woody for his collection to make a small fortune. 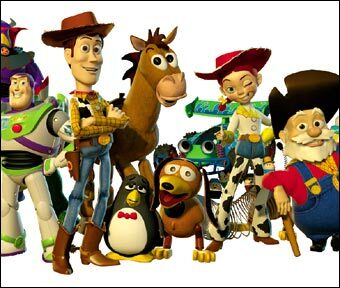 The rest Andy’s toys led by Buzz set out to rescue their pal. This was wonderful to see. I wanted to see what Pixar would make of the super collector nerd. It came across as evil which is true since the collector stole Woody. But it was truly fun to see. 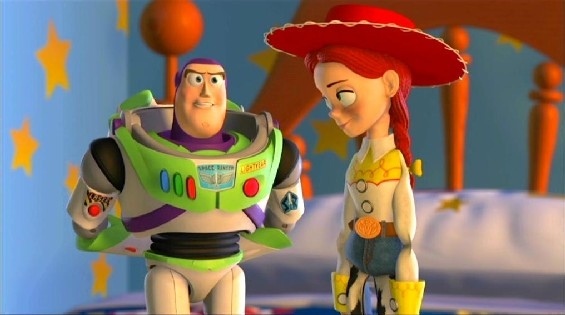 What really got me was at the beginning of the film, I saw Woody realize that Andy was going to grow up really soon and not be interested in playing with his toys. You genuinely feel bad for Woody. This would come in to play in Toy Story 3. Some new characters come in to play in the sequel such as Woody’s toy friend Jessie played by Joan Cusack. Excellent character and voice actress to give Jessie life. And not only was the story just as good as the first film or better, the animation in just a few short years got 100 times better. You can really notice a difference between the technology between the first two films. AMAZING. Toy Story 2 comes with an impressive 1080p picture presented in 1.78:1 aspect ratio. Just four short years from the first film, technology came so far that not only does the 3D look significantly better than the first film, but the overall CG quality and clarity is significantly better as well. The 3D really pops. From the first scene of the film till the last scene of the film, the 3D never stops. There is a treasure trove of pop out effects throughout the film and the depth is uncanny. It looks really great. The detail and colors are vibrant, and perfect. Flawless video presentation. The Buzz video game is just packed with objects flying out at you. Loved every minute of it. The audio is aDTS-HD Master 5.1 mix and is also perfect. The dialogue is crystal clear and robust and the action sequences pack bass and full sound. And yes Randy Newman is back for his music to light up your room. This audio/video presentation is incredible. 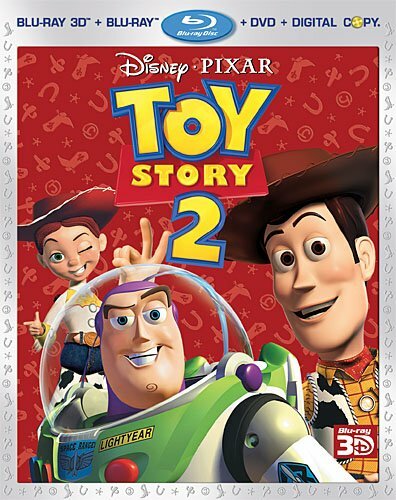 Making Toy Story 2 (SD, 8 minutes): Your normal behind he scenes short featurette. John Lasseter Profile (SD, 3 minutes): A portrait of Lasseter and how he inspires the Pixar team to push the envelope. Cast of Characters (SD, 4 minutes): A guide to the characters of Pixar. Toy Box (SD, 14 minutes): Some gag reels and bloopers to make you laugh. Plus some easter eggs that will amuse you. Design (SD, 27 minutes): A big dose of character and background design for the film. Again for you tech people this is for you. Production (SD, 14 minutes): “Designing Woody’s Past, “Making Woody’s Roundup, “Production Tour,” “Early Animation Tests,” “International Scene,” and “Special Effects” are the little docs in the this section. Very informative and fun to watch. Music & Sound (SD, 14 minutes): “Designing Sound,” “Making the Songs,” “Woody’s Roundup Music Video,” and “Jessie’s Song” are included in this section. Learn about the sound of the film and some music videos. Audio Commentary: Director John Lasseter, co-directors Lee Unkrich and Ash Brannon, and co-writer Andrew Stanton give the commentary. They all have so much love for each other and the film. These guys don’t only work together but it seems they hang out together. What a fun commentary. I wish all commentaries were like this. Toy Story 3 Sneak Peek: The Characters (HD, 4 minutes): A short little feature that gives you a glimpse of the new characters for Toy Story 3. Studio Stories (HD, 6 minutes): The minds at Pixar share some really fun and interesting stories that happen in the studio. One involves the film almost being erased from the computers. Love this extra. More of this please. Buzz Lightyear Mission Logs: International Space Station (HD, 4 minutes): Buzz talks about his real mission and his space station. Really fun and cool to see the characters do this. Paths to Pixar: Technical Artists (HD, 4 minutes): Some Pixar artists discuss how they came to be at Pixar. Inspiring. Pixar’s Zoetrope (HD, 2 minutes): What is a zoetrope? This will tell you. Go see it. Celebrating Our Friend Joe Ranft (HD, 13 minutes): A tribute to Joe Ranft, who worked at Pixar from the start. He was the voice of Heimlich the Caterpillar in Bug’s Life. He passed away and this is a dedication to his life and work. Toy Story 2 is really an upgrade from the first film. The 3D is better as well as the sound, video, and story is better in my opinion. I love everything about this film and this release. The 3D is amazing and the extras are fun as hell. The film sounds and looks stunning. This is a must own for everyone. Get this as soon as possible. This entry was posted on Tuesday, November 15th, 2011 at 2:03 am	and is filed under Film. You can follow any responses to this entry through the RSS 2.0 feed. You can skip to the end and leave a response. Pinging is currently not allowed. We have enough. You can stop now.